It's the goal of many people throughout the world - playing online poker for a living instead of working at a typical 9-5 job. Despite the fact that games are harder now than they were during the "dot com boom", you still have an excellent chance of making a living playing online poker tournaments, provided that you put in the work (study) and practice proper bankroll management. 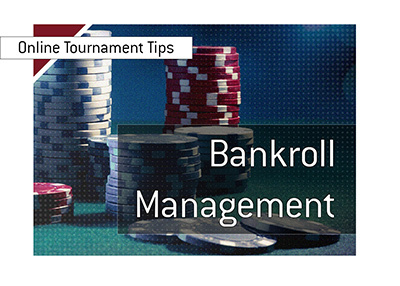 Proper bankroll management is the key to establishing longevity in the online poker world. Even the best poker players in the world go on downswings - by practicing proper bankroll management, you won't go bust if you have a bad weekend. It is super tempting to jump into a high buy-in tournament, especially if your favourite Twitch.tv poker streamers are playing. Playing above your bankroll, however, is disastrous to your financial well-being. Do you want to do this for a living? If so, you need to follow the proper steps and build your way up. All of your favourite poker players have one thing in common - they all worked their way up from the lowest levels, and this is what you need to do as well. If your bankroll is $1,000, you shouldn't be playing in $22 tournaments. Instead, you should be playing in tournaments with a max buy-in of $10 and building your bankroll up. If you have a couple of "binks", you can move up accordingly. 2. You should avoid rebuy events for the most part - there is no quicker way to incinerate your bankroll than to re-buy 6-7 times in the same tournament. 3. If you play in turbo tournaments, you should have double the "standard" tournament bankroll, due to the higher variance. If you are playing in turbo events, have a minimum of 200 buy-ins. 4. You should avoid other "games" such as sports betting and casino games - these are not appropriate to play if you are planning on doing this for a living. Follow these rules and you'll have a much better chance of making it as an online tournament player. In addition, study, study and study some more.